The greater Boston area has been slammed by numerous winter snowstorms over the last month with significant snowfall accumulation. According to a recent news report from News 10, two people were injured when a large amount of snow fell off the roof of an ice rink in Cambridge. A 33-year-old man and 20-year-old woman were completely buried under then snow, and a rink operator had to help out. It has been reported both victims were hurt by the snow, but not seriously injured. This time of year, emergency rooms across the Commonwealth are full of people injured from snow and ice-related accidents. If you have been injured by slipping and falling on ice on someone else’s property, you have a valid personal injury claim. One of the main things that determine whether you have a case is if the property owner or manager had a reasonable opportunity to know about the icy conditions and a duty to make the condition safe. First, with respect to the issue of a duty to make the property safe, Massachusetts has a more progressive version of premises liability law than other states. Originally, Massachusetts, like most other states, distinguished between whether injured plaintiff was an invitee or licensee. These categories were further broken down into social and business invitees or licensees, and landowners had a different responsibility to make their property reasonably safe, depending on the reason plaintiff was on the land. This often led to confusing and illogical results, so the Supreme Judicial Court (SJC) did away with these distinctions in the 1970s. Under current law, landowners have a duty to act as a reasonable and prudent person with respect to making predictable guests safe from predictable injuries. Basically, if landowner knows someone is likely to be on the property, and knows or should know of present danger, he or she has a duty to act in a reasonable manner to prevent a person from being injured. This may include making adequate repairs or putting up warning signs, depending on the situation. Ice and snow on steps or a walkway is one way a property can become dangerous. A landowner is reasonably expected to know his steps or driveway will become icy when it snows. What steps he or she must take to prevent someone from being injured depend on the situation. In some cases, pre-treating the steps may be required. In other cases, clearing and salting the steps once it is safe to do so may be required. It should be noted it is never required for a person to go out in the middle of a blizzard and shovel when it would be dangerous to do so. 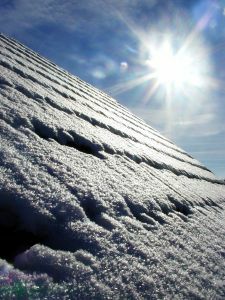 In the case of snow on a roof, the issue would be whether landowner has reason to know or actually knows there is enough to snow where a passerby could be injured. If a similar accident had happened in the past, this can be used to show landowner had actual or constructive knowledge this type of accident was likely to occur.